Now is the time, and Ressler Motors of Bozeman, Montana is the place, to get the vehicle that you have been looking for and the price that you can afford. Ressler is home to a big selection of pre-owned and certified pre-owned vehicles that bring people from miles around. 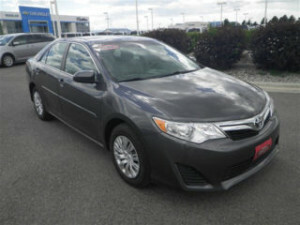 One example of what we offer is the fun to drive, fuel-efficient Toyota Camry. Mile after mile, you can depend on the Camry to get you where you need to go in style and comfort with less money spent on filling up your gas tank. Come take one for a test drive with us, and drive away happy knowing that you got a great deal on the exact vehicle that you had your eye on with us. When it comes to your daily drive, whether short or long, you want a comfortable seat to get there. When it comes to comfort and convenience, the Toyota Camry has it all in one great-looking package. Whether you are spending that drive on the freeway, busy city streets, or backroads, your new Camry will get you there in the best seat in the house. Come take one for a spin with us, and see why so many people choose the Camry as their next vehicle with a pre-owned one that you can’t help but love at Ressler Motors. If you are tired of getting the runaround when it comes to shopping for used vehicles near Bozeman, we would like to offer you a better way to shop for your next used vehicle by choosing a great one like the Toyota Camry at Ressler Motors. Whether you are looking for your first car or your next car, this is the one that you have been waiting for. Better yet, since it’s from Ressler Motors, you know that you can depend on your new car for years to come. At Ressler Motors, we do used cars right near Bozeman.